United on a mission to join the ranks of Sheffield's (UK) long history of nurturing great artists; Habberdash formed early in 2013 armed with the verve and determination to deliver music that is both packed with explosive melodies and their own amalgam of versatile guitar-driven alternative pop-rock. Having garnered a strong army of loyal fans and followers across their native South Yorkshire, the exuberant on-stage performances delivered by the four guys - has earned them numerous headline shows, an appearance at UK's legendary Y Not Festival and support slots with the likes of The Buzzcocks and Crazy Town. 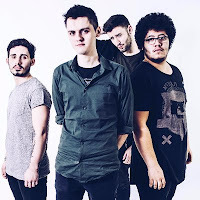 Producing a synth-edged modern rock sound, Habberdash frequently draw comparisons to the likes of Don Bronco and other contemporary bands who can knock out huge guitar riffs with stadium-esque chorus lines. Trying to create 'fresh' and exciting music, the Habberdash crew bring a diverse collection of influences and genres to their creative table, including Lower Than Atlantis, The Beatles, Nirvana, Issues and Bruno Mars. In late 2017, the band consisting of Kriss Stainton (Vox), Hayden Marshall (Bass), Ashley Houldon (Guitar) and Andrew Holland (Drums), headed into Derbyshire's renowned production house 'Tree House Studios' to develop new material with emerging producer Daniel Jeffery. The result becoming a significant leap in the bands refinement of sound and musical maturity. This collection of material forms their attention grabbing new EP 'Morning After The Madness' - to be launched later in 2018.